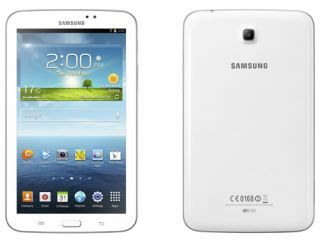 Samsung unveils Galaxy Tab 3 7in tablet | What Hi-Fi? Samsung has unveiled its latest tablet, the Galaxy Tab 3, ahead of its release in May. The 7in slate includes a 1.2GHz dual-core processor, 1GB RAM and a 1024x600 screen, delivering 169ppi. The successor to the Galaxy Tab 2 7.0, the Galaxy Tab 3 is available in in 8GB and 16GB versions, with a microSD slot allowing for expandable storage up to 64GB. You also get a 3MP camera around the back and a 1.3MP front-facing one for video calls. Weighing in at 302g for the wi-fi-only version and 306g for the 3G-equipped model, the Galaxy Tab 3's a little lighter than the 340g Google Nexus 7 – but Samsung's 169ppi screen doesn't compare to the Nexus 7's 216ppi display. The wi-fi-only Samsung Galaxy Tab 3 will hit store shelves in May, while its 3G counterpart will arrive in June – though pricing has yet to be revealed. UPDATE: Samsung has since added 8in and 10.1in models of the Galaxy Tab 3.